When Northern Ireland open their Euro 2020 qualifying campaign on Thursday at home to Estonia, there will be a familiar face in the visiting dugout. 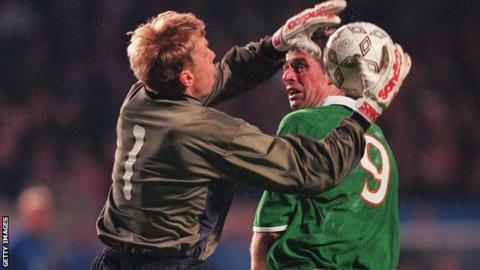 Former goalkeeper Mart Poom, who became Estonia's most famous player after representing five different clubs over 15 years in England, is now his country's goalkeeping coach. A Premier League cult hero who won at Old Trafford on his Derby County debut, the 6ft 4in Poom is focused on preparing Estonia for a intimidating Group C campaign which will see them take on Germany and the Netherlands. "Someone asked if I was disappointed with the draw but I think it's wonderful," said Poom from the training base of FC Nõmme United, the Third Division club he runs in Tallinn. "We know it's a very big task for us but to play against European superpowers like Germany and Netherlands, it's fantastic for our country. With away trips to the two top-seeded sides in the group further down the line, both sides lining out at Windsor Park on Thursday understand the importance of claiming points in the early rounds. "To get even a point would be a very good result for us," Poom added. "Northern Ireland are obviously physically fit and have players from good clubs. "Also, because they don't have as big a pool of players as England, I think they play together well and know each other well. I'm sure they will put us under pressure. They will probably press us high and try to play quick, attacking football. "I know Northern Ireland will think 'we have to beat Estonia in the first game at home'. So it should be a good contest." Estonia, population 1.3 million, have never qualified for a major football finals but the recent performances of other smaller nations - including Northern Ireland's run to the knockout stage at Euro 2016 and Iceland's World Cup qualification - have instilled hope. "They have shown smaller nations can qualify for major tournaments. It's something to aim for if you have a good manager, good staff, great team spirit. If the players work towards a common goal and you have a little bit of luck, everything is possible," Poom argued. The closest Estonia have come to qualification coincided with the last time they faced Northern Ireland. They finished second in their qualifying group for Euro 2012 and beat Northern Ireland twice, including a 2-1 win at Windsor Park in October, 2011, but they lost to the Republic of Ireland in the play-offs. "The clubs in the Meistriliiga (Estonia's top division) are investing in the teams and facilities and coaching," added the 47-year-old. "There are big steps to go but we can't forget we only got independence again in 1991. We were missing from world football for 50 years when we were under the Soviet Union so it was a long break to catch up." It is 10 years since Poom retired from a playing career that included a six-year spell at Derby County and time at Portsmouth, Sunderland, Arsenal and Watford. "I try to go once or twice a season to watch Derby and my old clubs," he said. "It's a surreal moment when you go to the stands to watch the game. Sometimes I have to pinch myself that I was here, that I played in the Premier League in front of big crowds. It feels like another life." The Estonian made a dream start to life with Derby in April 1997 as his side beat Manchester United 3-2 on a famous day for the Rams. He points excitedly at a framed shirt hanging on a wall near his office signed by Peter Schmeichel, his opposite number that day. "This guy was my hero," he admitted. Had Derby accepted a bid from Manchester United, Poom said he could have followed in his hero's footsteps: "(United) were looking for a second choice to compete with (Fabien) Barthez. There were one or two bids. "I heard there was interest and when the club said 'no, he's not for sale' I got on with my work and my life. There's no regrets." The esteem with which Poom was held by his clubs is perhaps best reflected in the reaction to him scoring one of the most famous goalkeeper goals in September 2003. With his new side Sunderland losing 1-0, Poom, playing at Pride Park for the first time since leaving Derby, ran forward for a last-minute corner and powered a thunderous header into the net. The standing ovation he received from both sets of fans remains one of the proudest moments of his career: "It's on YouTube and it's still shown now and again when they talk about crazy goalkeepers scoring goals. "I'm pretty sure I should stay in the top 10 (goalkeeper goals) because it was a good header!" So, should Estonia find themselves a goal behind on Thursday and win a last-minute corner, will Poom be waving his number one forward? "We'll have to discuss that with the manager," he smiled. "First, I hope our goalkeeper keeps a clean sheet."